12 Hours #187 Coverage Denied! 24 Hours #181 CA Claims Adjusting - Includes Ethics! 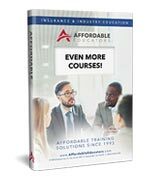 LOOKING FOR EVEN MORE CE COURSES? We have dozens of quality courses for various licenses to help satisfy all your Continuing Education needs. Need help choosing a course? Give us a call! Best Value Since 1993! Pay after you pass! I absolutely recommend this place for continuing education and licensing courses. I have been doing my credits with Affordable Educators for at least 10 years. Our reputation for superior value and great customer service is a major element of our success and our high referral base. If you have any questions about our courses, please feel free to call or email us at orders@ceclass.com.